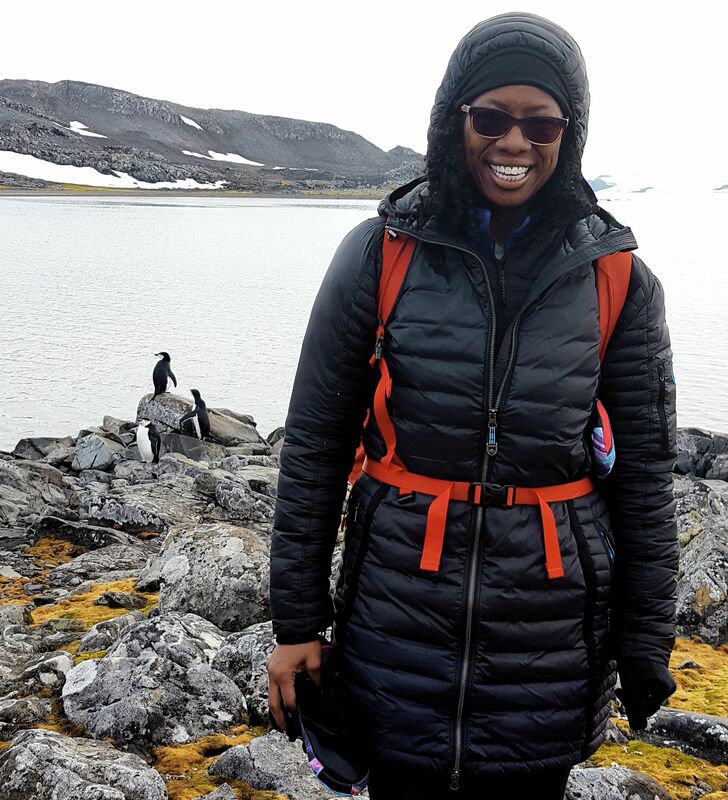 After completing a rocky course with heavy wind and freezing temperatures in Antarctica, Lisa Davis danced. Hard. 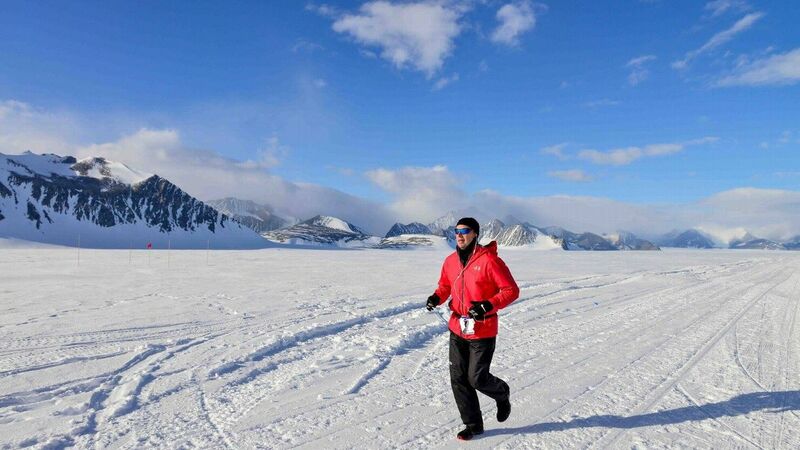 SUFFOLK, Va. -- Seven marathons in seven days on seven continents -- daunting? More like doable, shrugs Lisa Davis, who has a habit of saying, "It's only 26.2 miles." 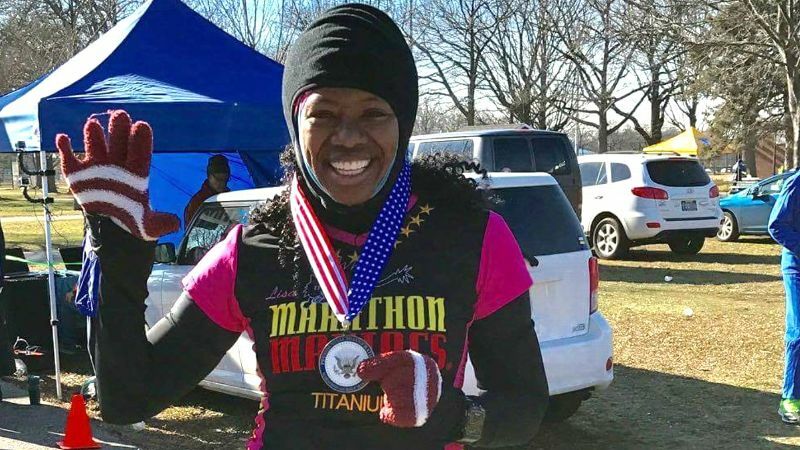 The retired Marine completed the Triple 7 Quest in January in seven days, 3 minutes and 27 seconds -- a record time for a female that will put her in the Guinness Book of World Records. The previous best for a woman exceeded 10 days. Davis also became the first African-American woman to complete the seven-stage course. "Why would anyone not do this if given the opportunity?" asked the 48-year-old Davis, most comfortable in her SparkleSkirt and one of a dozen pairs of Hoka shoes. "I love the feeling of accomplishment. First of all, I love to run. If running was an illegal drug, I'd be in the program. I'm addicted to it." She didn't know it at the time, but Perth, Australia, marked the last time Lisa Davis got to enjoy the taste -- and nutrition -- of peanut butter. The loop started in Perth, Australia, and continued to Singapore (Asia), Cairo (Africa), Amsterdam (Europe), New York City (North America) and Chile (South America), and concluded with the White Continent Marathon in Antarctica. She packed everything from salted caramel energy gel packs and precut strips of kinesiology tape, to tank tops for Australia and Egypt, to hand warmers, a ski mask and duct tape for Antarctica, to fluffy holiday socks for the flights. To grasp the scope of her achievement, consider that in a week's time, Davis completed 183.4-plus miles -- she got lost for a spell during her marathon in Cairo -- while spanning the globe on 18 flights in approximately 110 hours of airtime. Not to mention those 42 hours, 46 minutes and 9 seconds of actual running time. Davis estimated her quality shut-eye -- or time spent in a hotel room bed -- amounted to roughly 17 hours over the seven days. "The Marine Corps prepared me well," said Davis, who retired as a major in 2010 after 24 years of service. "When I deployed, I worked 16- or 17-hour days almost for a year. We stood duty once a month for 24 hours after working all day; that's almost 48 hours with no sleep. I am familiar with doing something major without sleep." The itinerary for the financial management analyst, who works out of her home in Suffolk, Virginia, left no time for, say, a trip to the Rijksmuseum or photos in front of the Pyramids of Giza. Starting with the initial trek from Norfolk to Charlotte to Dallas to Sydney to Perth (33 hours, 10 minutes), Davis followed a schedule befitting, well, a Marine. No matter the continent, she and the others (five men, two women) went from airport to hotel to start line, and then back to the hotel to sleep if time allowed. Often there was only time for a shower, given the need to catch the next flight for the next leg of the trip. 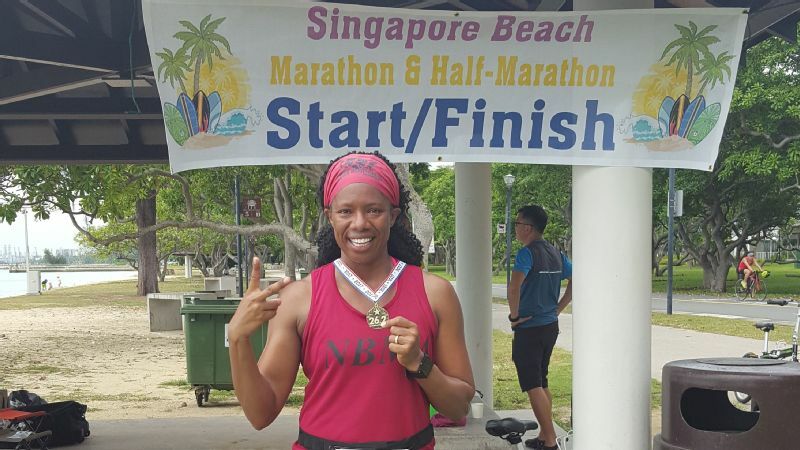 Lisa Davis was still at the start of her journey when she reached the finish line in Singapore. While participants in World Marathon events boast faster times, they benefit from charter planes, chefs and trained medical personnel. Those amenities come at a price tag of $40,000. While Davis won't say that doesn't appeal to her, she points out the entire Triple 7 Quest was a gift for her 47th birthday from her husband, William Perez. "That didn't appeal to him!" she exclaims, breaking into a toothy, full-faced smile. Perez paid the $14,000 in entry fees for his wife to complete the quest, though she estimates that some of her own decisions, such as airline upgrades, probably pushed the price tag for the entire adventure to $36,000. She opted to pay more for first-class, noting, "I did all of this on a bum right knee" -- a nagging injury from an old roller-skating spill. The extra room allowed her to stretch out to maximize her recovery time as much as possible, given that most of it was spent in the air. Perez didn't accompany her either. 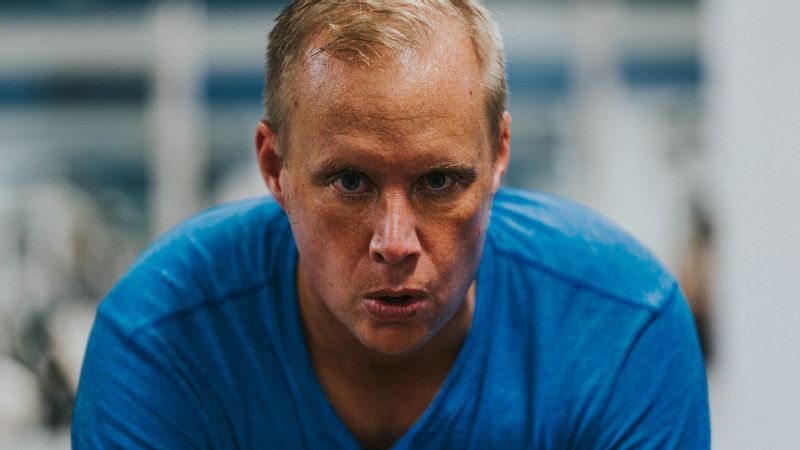 Far more interested in recreational softball than running, he has attempted only one marathon. "And I felt like a train hit me the next day," he said. Davis, on the other hand, ran her first marathon in San Diego in 2002. 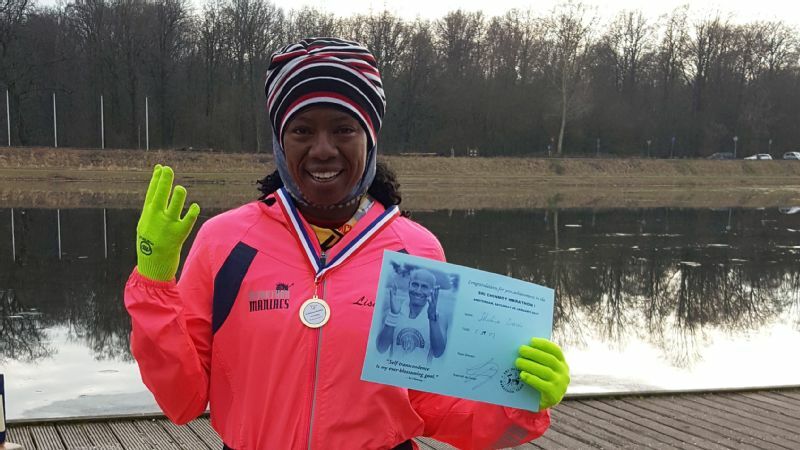 Running held appeal as a way to lose weight after the birth of her daughter. Often when she competes, and almost always when she trains, she carries a standard American flag on a 5-foot pole. "Great workout for the core," she said. 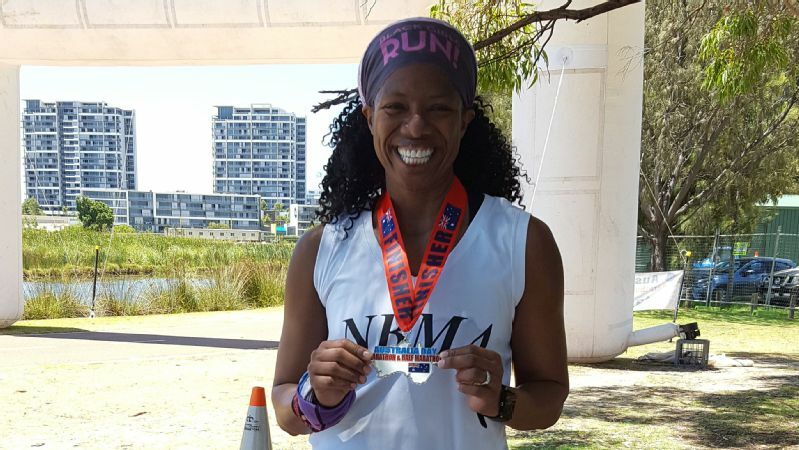 Last March, Davis completed her 100th marathon in nearby Newport News, Virginia. 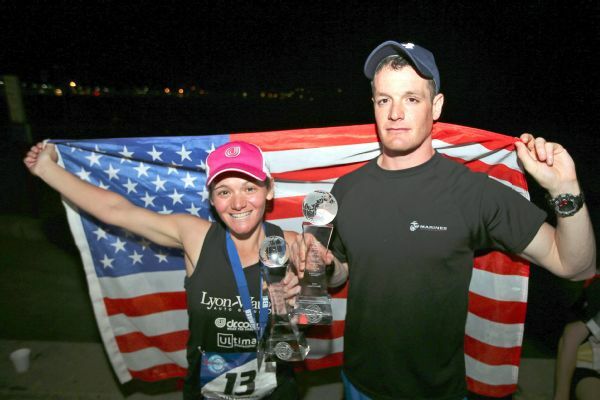 Last fall, by finishing a marathon in Hawaii, she was able to say she has run one in all 50 states. Include the Triple 7 Quest, and Davis has her own hat trick of marathon accomplishments. "I wanted that; I'm very goal-oriented," says the woman who left the Chicago projects behind when she was 17 by enlisting in the Marines, where she earned a bachelor's and two master's degrees. 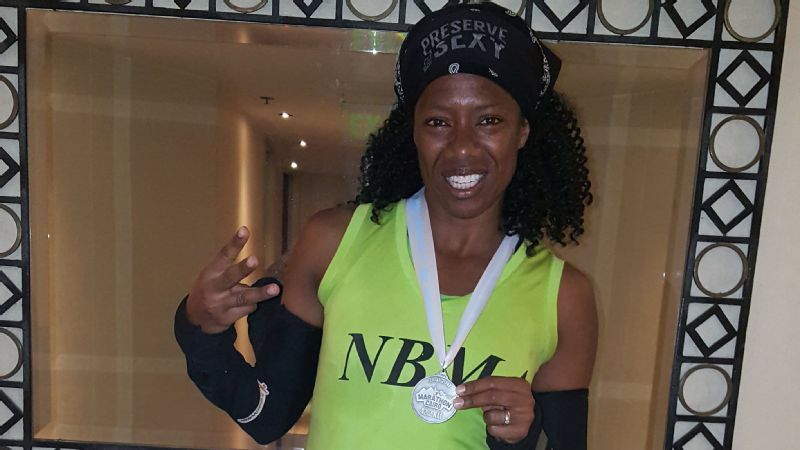 The streets of Cairo were full of honking hazards, but Lisa Davis still made it the 26.2 miles (and then some). Davis and the other seven runners attempting the Triple 7 Quest faced their first major hurdle when an oil spill delayed their flight into Cairo. Layers of security in Egypt only added to what she called "mass pandemonium" that nearly prevented them from getting to the start line on time. After landing, the chaos began. "We got dressed in the van, throwing on clothes every which way," Davis said. "We had no food, no water, nothing. My heart was already racing, and I hadn't taken one step into the race." The event itself added another layer of stress, given an unmarked course and traffic along the route that was essentially oblivious to the competitors. Annoyed drivers showed their frustration by leaning on their horns repeatedly. "The whole time I was thinking, 'We're going to die,'" said Davis, whose initial attempt to find a restroom was problematic because she was not covered in traditional Arabic garb. "I'm surprised I didn't get hit by a car. Traffic signs there are only a suggestion." Lisa Davis crossed the halfway point of her trek somewhere in Amsterdam. Eating nutritiously throughout became a challenge she didn't anticipate. It wasn't until Davis was in the airport in Singapore that she realized that unless she was in North America, nothing from her carry-on bag or purchased in the airport could be taken on board. "Perth was the last time I got peanut butter," said Davis, who relied primarily on airplane food, including a mystery meal she later learned was some form of seafood. "I normally wouldn't eat it, but I did. I typically don't eat bread either, but I ate whatever they gave me to feel full. If I got a fruit or vegetable, that was gold." An earache, sniffles and chest congestion tagged along with Lisa Davis during her New York leg. And beyond. While the fifth leg of the trip brought a cheering section of extended friends to New York, being back on American soil didn't prove hassle-free. One of the participants from India faced delays at JFK Airport over President Donald Trump's immigration restrictions; the weather was miserably cold; and Davis realized she was getting sick. "Looking back, that was the start of the flu," she said. "I had congestion in my chest; my nose was runny; my ears ached. It got progressively worse, and then I jumped on an airplane and coughed the whole way to South America." 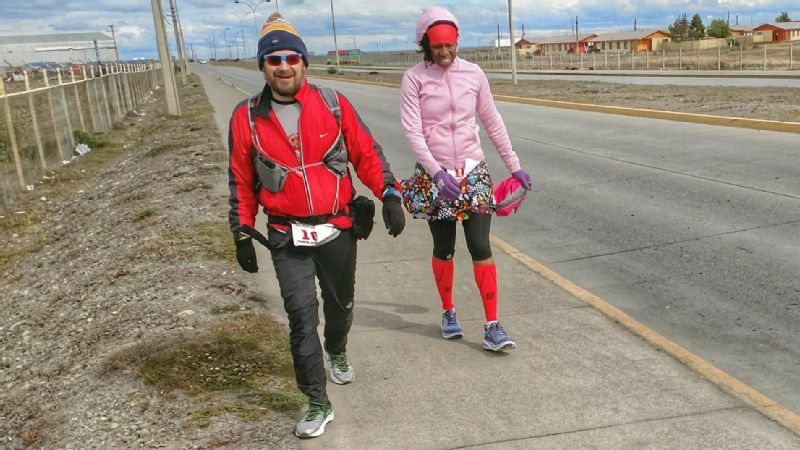 That made the sixth leg, in Punta Arenas, Chile, near the country's southern tip, even more brutal. "It was absolutely freezing," said Davis, who contended with the stench of exhaust fumes in addition to her own congestion. Stray dogs, including one particularly friendly mutt, kept her company on the course that was a bike path along the beach. Sleepy and hungry, she told volunteers supporting the race, "Do not let me stop." Lisa Davis thought Chile was cold. Until the next day. After finishing that one, adrenaline alone could have carried her to Antarctica for a race so coveted the entry fee is $8,000. A trip to the world's coldest continent is more like going to outer space than visiting any of the other six. The Earth's southernmost land mass is largely uninhabited, unless you count seals and penguins. Davis saw plenty of both, arriving in the morning and lugging all her belongings -- and a tent for the night -- with her from where the plane landed to the start line. It was an hour's walk through flurries. "Was it cold?" she said. "Cold would be nice. It was absolutely grueling." She wore layer upon layer topped with a jacket, a ski mask, multiple pairs of gloves and duct tape to keep her sneakers dry along the trail that was largely melted snow atop hilly terrain. "The entire course was rocks," she said. "There was no part of that course that did not have rocks. We ran on top of rocks the entire way." She kept her spirits up by photobombing a group of Chinese tourists along the route, but she admits she grew weary of an unforgiving wind that made her curt with a German camera crew fascinated by her journey. "I got to the point I didn't want to be bothered," she said. A few well-dressed locals helped Lisa Davis smile after she finished the final leg in record time. Crossing the final finish line in 6 hours, 45 minutes -- her worst time among the seven runs -- Davis did the obvious. "I just danced," she said. When she runs, it's usually Adele, Drake or Beyoncé inspiring her to keep moving. This time she didn't need music. "I was dancing so hard," she says, describing a giddy scene. "Everybody was dancing. I was completely delirious." She barely slept that night either, nestled in a small tent with two other runners, her sleeping bag filled with every hand warmer in her possession. Davis spent the whole night thirsty but didn't dare drink. The idea of using the bathroom outside in the Antarctic night gives her shivers even today. Why would anyone not do this if given the opportunity? "It was like minus 1,000 degrees," she said. 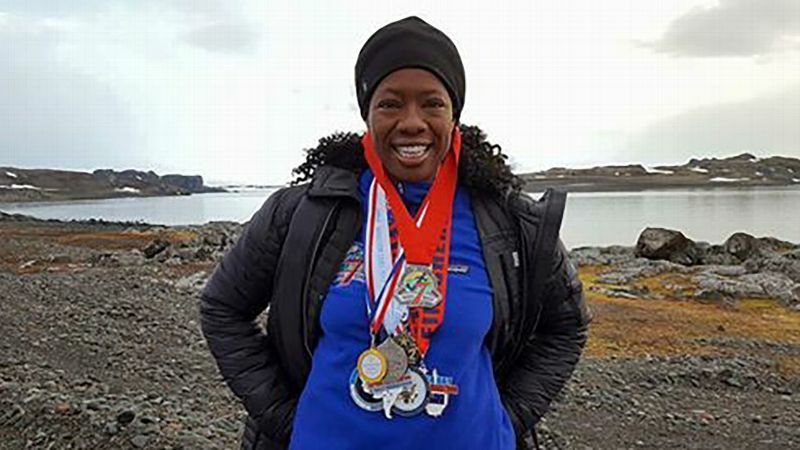 After all that, Davis let 24 hours pass before she ran in another marathon in Chile, when her flight back to the United States was delayed a day. "I was actually going to do the 50K," she said. "The only reason I didn't do the 50K was because I had to go to the bathroom and there was no toilet on the course. I would have had to go back to the hotel and come back out. That was too much, so I just did the marathon [40K]." Perez has become so accustomed to Davis' nonchalant attitude about distance running that sometimes he has to remind himself of the magnitude of her accomplishment. "Whenever we're around her running friends, though, it hits me pretty quickly." Like any high achiever, she already has her eye on the next challenge. Davis is registered for the Great Wall Marathon in China in May, which includes 5,164 steps to climb. But here's what has her really jacked: Scientists recently discovered an eighth continent -- Zealandia, which is 93 percent submerged in the Pacific Ocean after breaking away from Australia. Organizers are touting the inaugural 8-8-8 in January 2018. 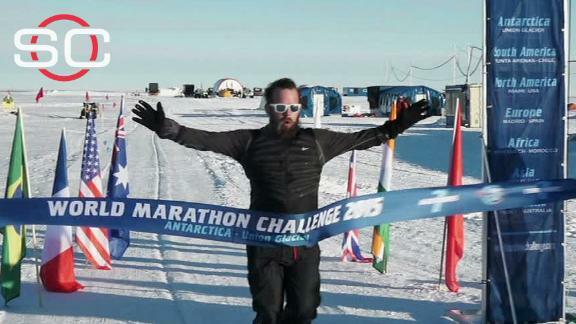 Eight marathons, eight days, eight continents. "I'm interested, so interested," Davis beamed. "I'm all over it."